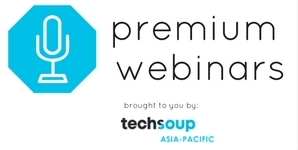 TechSoup is proud to offer it's very own series of premium webinars, or web-based lectures/talks delivered by experts from all across the globe. Through premium webinars, all qualified NGOs will have the chance to learn directly with experts on topics such as technology, non-profit operations, marketing and a variety of other relevant areas of their NGO's operations. These webinars can either be directly hosted by TechSoup's internal network of experts or in collaboration with partners from across the globe. Get passes to premium webinars, online courses and regional events for an entire year by requesting for the Boost Training & Support Package. If eligible, your organization may request for as many seats as you would need for every premium webinar offered.